Low-Price Acer Chromebook: What a Computer Should Be? The Acer AC700 Chromebook is an excellent, lightweight, and fast booting computer that just might have users thinking about computers in a complete new way. This Acer computer is the least expensive Chromebook released so far. It features an 11.6-inch screen, basic black styling, and a $349 price tag. But its most outstanding feature is that it runs Google’s Chrome OS. 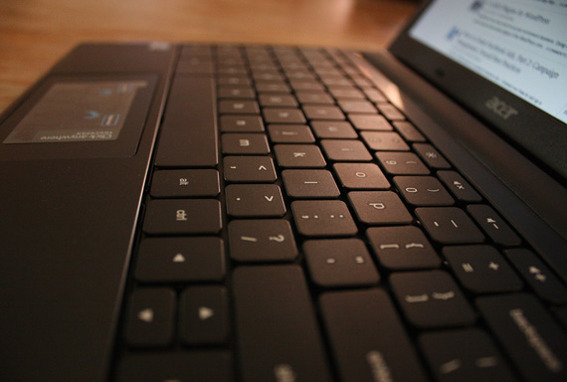 The Acer AC700 Chromebook features basic styling. To borrow a line from Google’s marketing material, “Chrome OS is a totally rethought computer that lets you stop worrying about your computer so you can focus on the Internet.” Here’s a Google-produced video on Chrome OS. For many users, a traditional computer operating system — like Microsoft’s Windows 7, Apple’s OS X Lion, or Ubuntu Linux — is simply a means to an end, or even a middleman. These operating systems are just a way to get a web browser up and running and access the Internet to read email on Gmail, post on Facebook, or even check in on an ecommerce store on remote web servers. Effectively, Chrome OS removes the middleman in this scenario and makes the web browser the operating system. As soon as the Acer Chromebook boots up (turns on), users are ready to surf the Internet. Booting up is actually one of this Chromebook’s most outstanding features. It only takes about eight-to-ten seconds to display the login screen after one presses the power button. From a hardware perspective, this lightning fast start-up is probably due to the Chromebook’s 16GB solid-state device (SSD) and/or 2GB of DDR3 RAM. Although it is not clear to me which of these the device is using to store its basic input/output system (BIOS), either would be much faster than the hard drives found in many laptops. The Acer Chromebook boots up in 8-to-10 seconds. The Chromebook also, presumably, benefits from having much less to load, since there are really no programs to start other than the Chrome web browser. The Acer Chromebook features what the company calls a “CineCrystal” LED-Backlit liquid crystal display (LCD). I just called it beautiful. It is very competitive, in my opinion, with some of the best tablet, netbook, and notebook computer screens I’ve seen. I was particularly impressed with its performance with video. 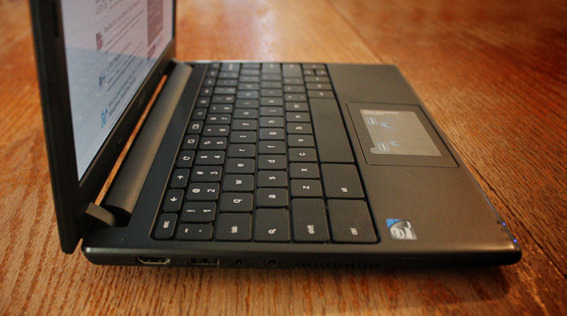 The Acer Chromebook easily endured roughly seven hours of constant use on a single charge. To test its battery, I plugged it into a 32-inch television via an HDMI cable, surfed to Hulu Plus, and let the family watch some of their favorite shows all afternoon and evening. In fact, a couple of times we just let it run while we did other things. In more normal use — web surfing, email reading, light document creation, and similar — the Chromebook could easily last a workday — almost two — on a single charge of its removable battery. My only real complaint about the Acer Chromebook is its tiny keyboard, which made it a little hard for me to type. I also had the weird feeling that the keyboard was somehow off center — like the “G” and “H” keys had moved into the “J” and “k” spots. But this likely had more to do with me being a little off. The Acer Chromebook’s keyboard felt small. 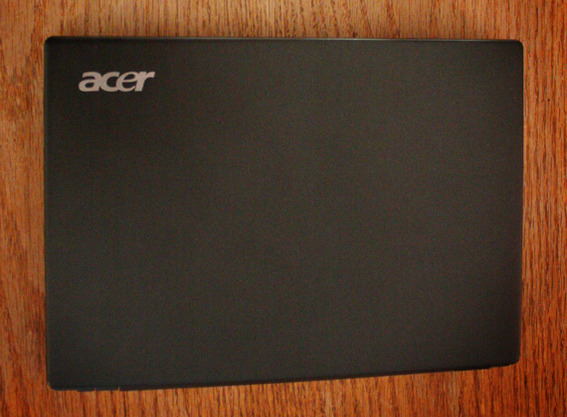 The Chrome OS is what separates this Acer from other netbooks. It provides a completely new computing paradigm that feels sometimes confining — since I was not sure how to complete some tasks in a browser only system — and sometimes liberating. In a way it reminded me of an old mainframe computer and terminal set up, but it also felt very forward-looking. When the Acer Chromebook arrived, I gave it a good look over, since I knew I would be writing this review. 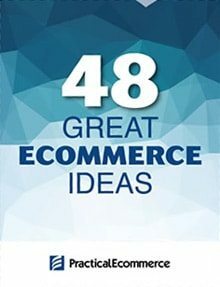 My first question — which I did not address in this article — was how would ecommerce marketers or entrepreneurs use this device, with its browser-only operating system and completely-in-the-cloud storage model. Eventually, I decided that this Chromebook would make an excellent choice for many Practical eCommerce readers. So much so that I decided to look at using the Chromebook for specific business related tasks in subsequent articles. I will start on those just as soon as I figure out how to do screen captures in the Chromebook. So stay tuned.